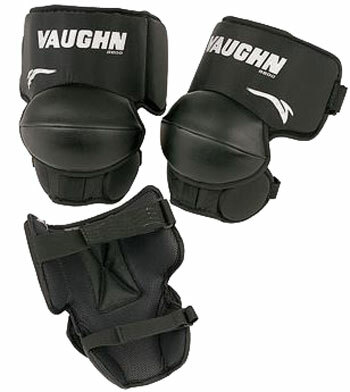 The Vaughn VKP 8800 knee and thigh protector is made of plastic and HD Foam to protect the top of the knee and the mid-thigh area. The unit is molded to fit close to the leg and fit underneath the goalie pants. Tabs at the knee area use lace attachments to tie into most goalie pads with tab attachment pieces.